Local investors rediscovered their appetite for risk yesterday, thanks to remarks from Chinese President Xi Jinping that helped tamp down trade war fears. The brighter mood defied the roller-coaster moves on Wall Street overnight to send the Straits Times Index (STI) up 16.42 points, or 0.5 per cent, to 3,466.38 - its fourth straight day of gains. The spur came in a much-watched speech yesterday, in which Mr Xi talked about gradually opening up the Chinese economy. JP Morgan Asset Management global market strategist Chaoping Zhu said: "President Xi's remarks do not represent a dramatic departure from existing Chinese policy, but rather a reiteration of the same themes... It is possible that measures announced today could help relieve global trade tensions." But he pointed out that the United States-China trade dispute will require more negotiation, so investors need to careful. FXTM chief market strategist Hussein Sayed said: "I think what was achieved today is likely to reduce trade tensions and buy some extra time... The probability of a full-blown trade war is now much lower than a week ago." 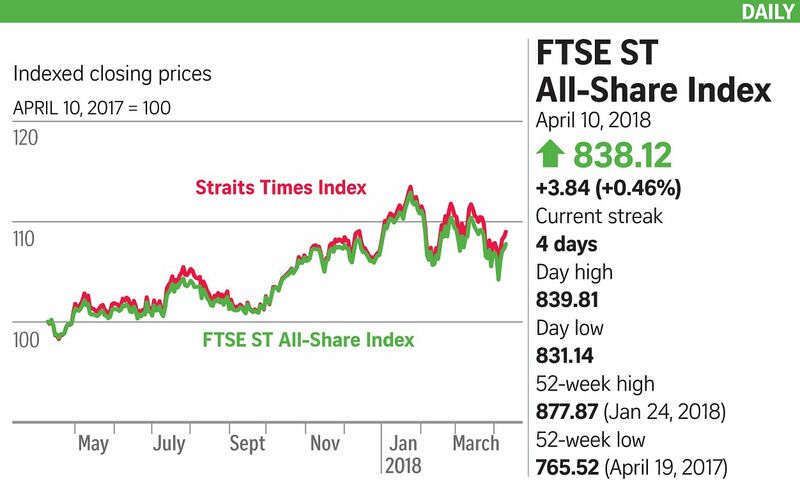 Phillip Capital noted that while the STI lost 2.6 per cent last month and was up just 0.7 per cent in the first quarter, it has not changed its bottom-up 3,900 target - a nearly 14 per cent upside potential. Turnover here yesterday came in at about 2.1 billion shares worth $1.4 billion, with gainers outpacing losers 254 to 174. Noble Group inched up 0.7 cent, or 11 per cent, to 7.1 cents. The troubled commodities firm said more than 70 per cent of its creditors have approved its debt restructuring plan, while there are news reports that founder and largest shareholder Richard Elman is pushing creditors for a new debt deal that could favour equity shareholders. Genting Singapore was the day's fifth-most active counter, with 34 million shares worth $39 million changing hands. The stock finished unchanged at $1.14, but has fallen 14 per cent since the casino operator reported its fourth-quarter results. "In our view, all signals point to the VIP and mass markets improving... and its current share price is unjustified as it implies 'crisis' valuations," said Maybank Kim Eng, which has a "buy" on the counter. Anchor Resources closed unchanged at 2.2 cents following news that it was tying up with a granite quarry licence holder to tender for Malaysian East Coast Rail Line projects.